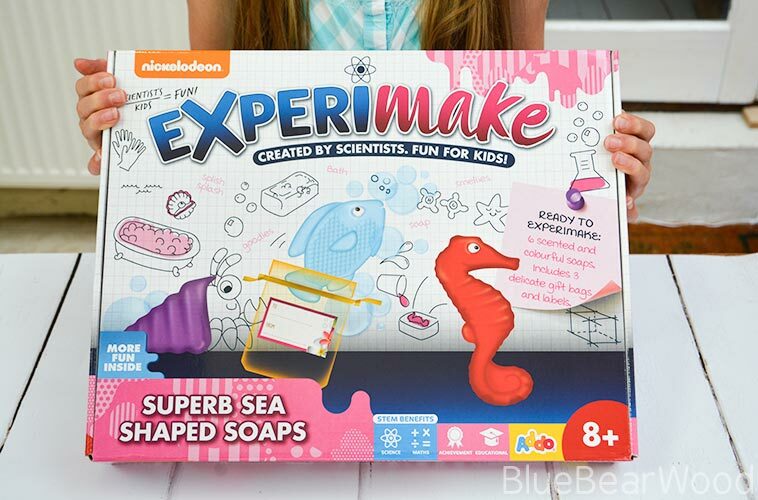 Experimake science sets have been designed by scientists to encourage kids to learn through play with the Superb Sea Shaped Soap kit being aimed at 8+ years. 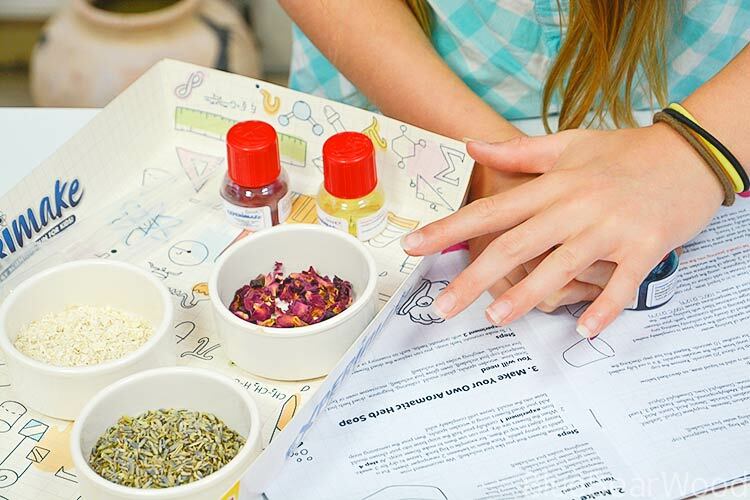 It comes with everything you need to make 6 scented and colourful soaps along with some fabulous educational support explaining a little about the history of soap and the chemical reaction that occurs between soap, dirt and water (that’s the science bit!). All the equipment comes carefully packed with in cute illustrated, cardboard trays that can be used as desk tidy’s afterwards (I love this!). – Educational support in the form of a periodic table, soap facts and details on how and why soap, water and dirt interact. The instructions are really easy to follow and my 10-year-olds managed on their own after I’d helped them make a blue fish to start with. 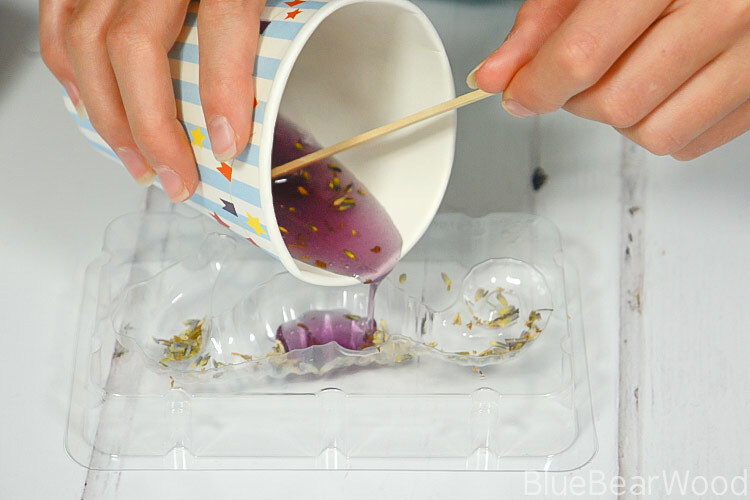 You will need to get a weighing scales and also a container to melt the soap in (paper cups are ideal for this). The melted soap is very hot so an adult does need to be around to help/keep an eye on things. 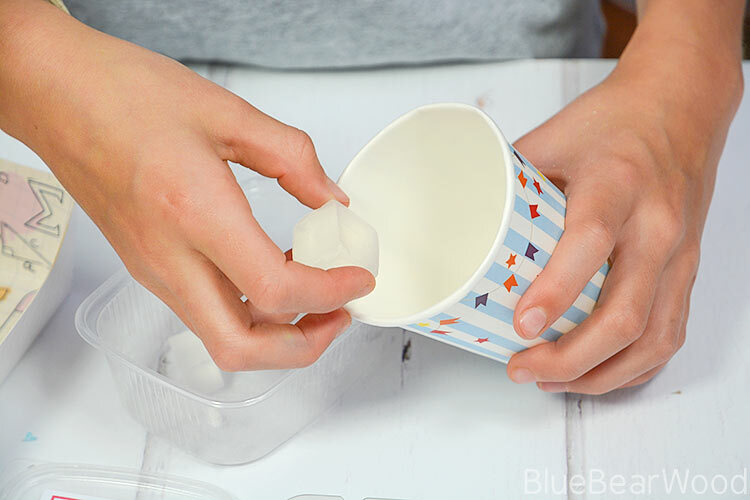 he easiest way to melt the soap is in the microwave but you can also use the bain marie method. Once the blue fish had been made Ro and Ra started to get adventurous, spurred on by the booklets suggestions of adding other ingredients such as dried flowers, oats, salt etc. 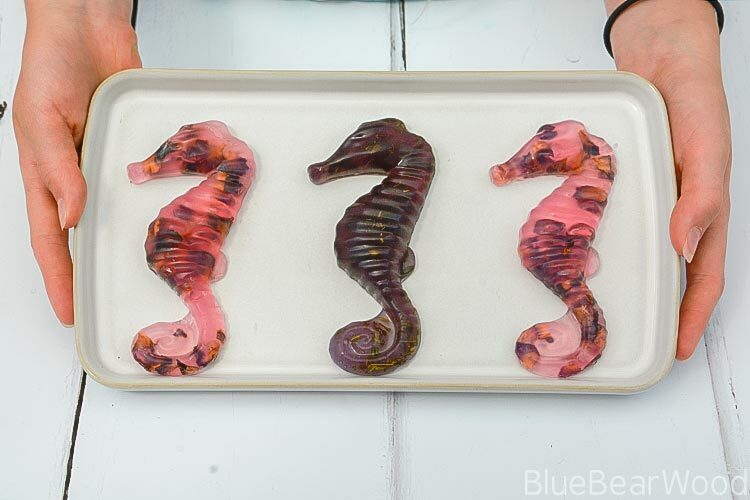 They mixed the blue and red colours together to make a purple seahorse scented with lavender (the lavender was an extra we picked from the garden). Then they added rose petals to get a gorgeous pink rose seahorse. They even tested their skills making a layered sea shell! Because the kit also came with three little gift bags and labels their obvious next step, once all the soaps had been made, was to carefully package them up and give them to friends and family. 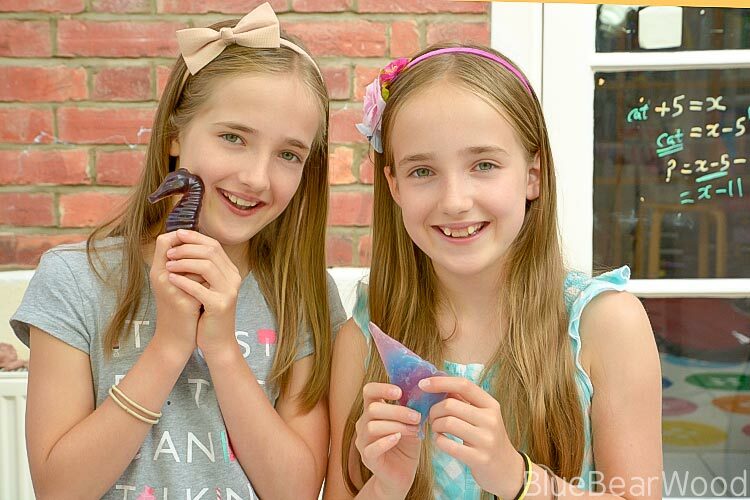 The girls absolutely ‘loved’ playing with this kit (watch the video above to see how they got on) and really enjoyed the flexibility of the materials that allowed them to experiment with other ideas and make their soaps individual. 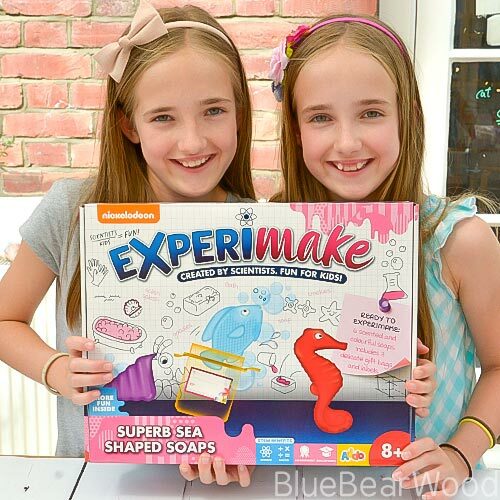 The addition of some soap fun facts made them go off and google a bit more about soap and its history which was perfect extension work to the kit. 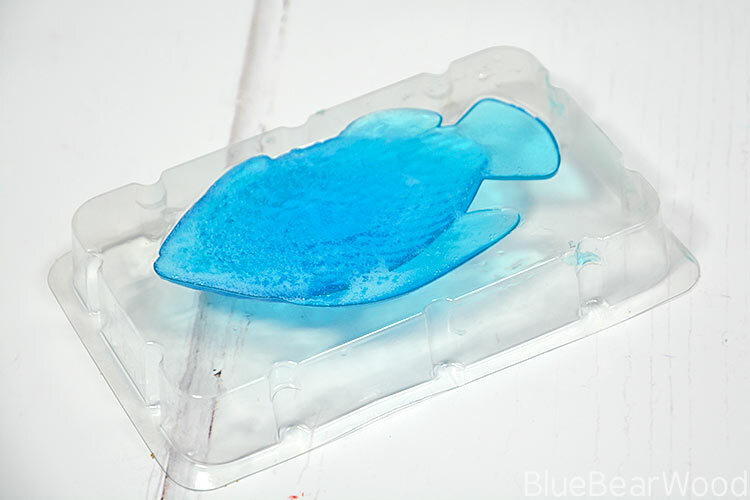 Be careful getting the soap out of the moulds once they have cooled (don’t be tempted to try and do this whilst the soap is still warm) and the fish, in particular, is very delicate due to the fins being so thin. Pushing too hard could crack the moulds you won’t be able to re-use them. I felt the scientific diagram explanation showing how soap, water and dirt react together was a little poor and could have been explained either more simply or needed a little more explanation (the use of the terms polar chain and polar extremity will probably not mean anything to most kids, and possibly quite a few adults). But this is a minor niggle and the content did spark an interest in the girls to find out more. – Don’t panic if the soap sets in the plastic cup. Just re-heat it again. – Try not to over mix as it creates bubbles in the soap. Alternatively, you can embrace the bubbles. They are a classic sea life texture! 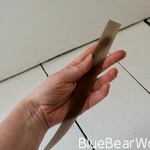 – Scrape up any spillages when cool and re-melt them. – When the soap has hardened it will still be quite warm. Put it in the fridge initially and then into the freezer to speed things up. – Try and protect the moulds. You can buy additional clear soap base to make great gifts for teachers, friends and family. 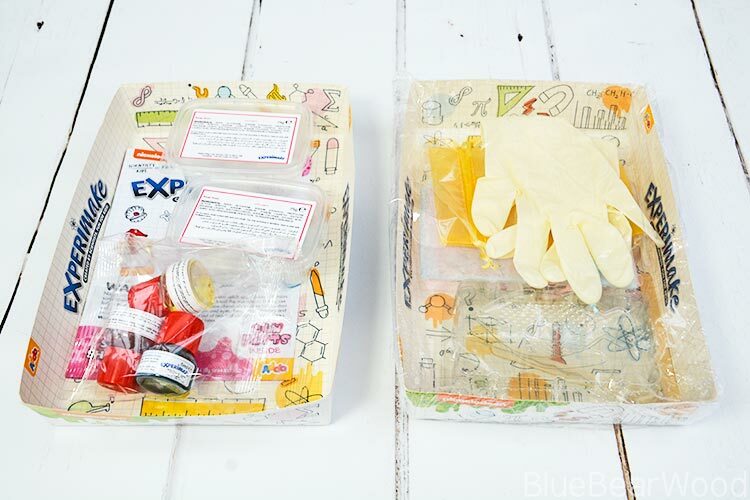 Now one lucky reader can win their own Experimake Superb Sea Shaped Soap Kit. All you have to do is follow the Gleam form below. – The winner will be sent ONE Experimake Superb Sea Shaped Soap Kit. – Competition starts on 01/09/2017 – 22/09/2017 11.59pm. 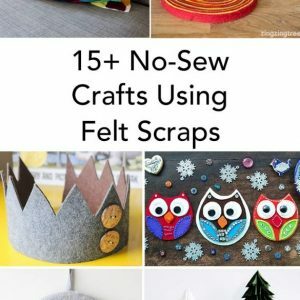 I love making with felt so any kit that contains felt gets my vote! We love Bird House Kits. Love making cards and collage. I like ones where you learn a new skill, like knitting or jewellery ones. Anything with stickers included is always a bonus. Anything that makes something you can use as a treat afterwards – there’s something really nice about being able to use something we’ve made ourselves like soap or chocolate! I love any type of craft. One of my favs is perfume making. Card Making or Cross Stitching. Bath bomb kits are so good!! I like ones that are easy to use and give quick results. My younger grandchildren are not known for their patience! Candle making. 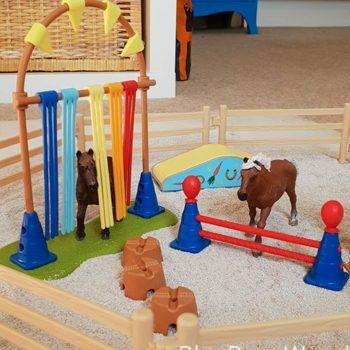 This looks really cute for my niece. I prefer kits that are complete. I have bought some for my children for Christmas before that’s required extra things like oils food colouring – which I didnt have at home, rendering those kits useless until I could go to the shops. It never made mention of it on the packet either, which was frustrating.. Its like giving a child a toy minus the batteries! 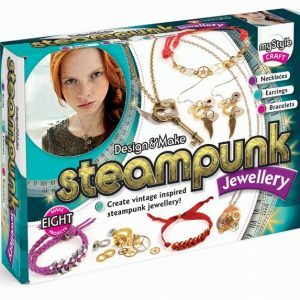 Making jewellery with the kids is fun!